Restaurant 1868 is one more reason to visit beautiful Avery Island. Open daily 9 a.m.-3 p.m.
About the restaurant: McIlhenny Company, the producers of TABASCO pepper sauces, have a restaurant at the visitor center and factory on Avery Island, which is located about 140 miles west of New Orleans. 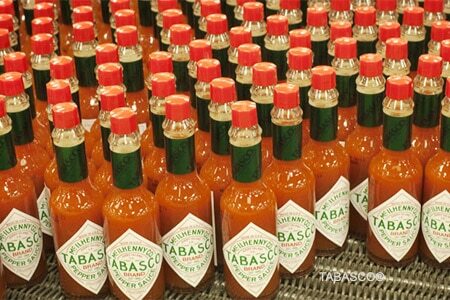 Likes: The tour of the TABASCO plant. Dislikes: Too much hot sauce in everything. Food & Drinks: If you like your food super spicy, this place may be for you. Almost every menu item is infused somehow with TABASCO sauce. While the gimmick is attractive, the food is a bit rough around the edges. Steeped in Cajun and Creole preparation, dishes lose some of their individuality because of the constant presence of hot sauce. Crawfish etouffée, red beans and rice, crawfish nachos, boudin and a host of other regional favorites would be better served with the hot sauce on the side, rather than in the original preparation. To be accurate, the boudin is presented with pepper jelly on the side, but the jelly is infused with --- you guessed it --- hot sauce. Even the dessert, raspberry chipotle ice cream, is too spicy. No alcohol is served, and the all-brown wood surroundings and cafeteria line do not combine to make this a very inviting dining experience.